Masters of the Word is an in-depth exploration of the rich world of traditional Jewish Bible commentators, from the first through the thirteenth centuries. It analyzes the methodology and style of each commentator against the backdrop of his time and place. It does so by studying each parasha as a unit, according to the views of one commentator, thus giving the reader an in-depth view of the commentators methods in a large, but manageable, passage. 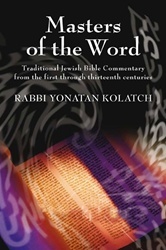 Not just another "parasha book", this pioneering work addresses such questions as: How did the times affect the commentator and how did he influence his times? What is the commentator's approach and attitude towards the oral law and rabbinic tradition? What were his goals? What kinds of textual problems did he deal with? These problems are dealt with clearly and reliably; the authors comments are fully footnoted. The book of Bereshit is divided into two volumes, with Volume I including the following commentators in chronological order: Chazal, Targumim, Zohar, R. Saadia Gaon, Spanish Linguists and Ba'alei Masorah. Volume 1 ends with Parshat Chayei Sarah. Bereishis / Genesis - 2 Volume Set Ramban Student Size 7 Volume Slipcased Set Directions in Rashi Chizkuni Torah Commentary by Rabbi Chizkiyahu ben Rabbi Manoach, 4 vols.